Sooo…clearly I’ve got a thing for button up shirts. They’re timeless, classy, easy to style (front-tuck into jeans or full-tuck into shorts with a tan leather belt) and always have that effortlessly pulled together feel. That’s a win in my book – and a closet staple that you can wear for years to come! 1. Gingham Bell Sleeve Shirt: Gingham is the hottest print for summer (well…in my opinion 😉 ) and I think that bell sleeve number above is seriously ADORABLE! I wear size small in this top for reference. 2. Striped Courier Shirt (same style, different striped option here): Alrighty sooo, this is my THIRD courier top by Madewell and I am not stopping any time soon! I also own this one in white and chambray. I love the short sleeves and the overall fit of this thing is perfection! Wearing size XS. 3. Billowy Sleeve Blouse: Ohh I am forever swooning over this romantic, whimsical top! I mean…when those two adjectives are used to describe a button-up top…it’s kind of a no brainer… 😉 Wearing size XS. 4. Striped Button Up (cutest bow-back detail, too! ): Okay so trust me when I tell you this top is SO. CUTE. Love it paired with jeans and some block heels for a casual, low-key dressed up look – and I’ve also been rocking it under my black overalls lately. It’s going to be a key piece in my closet through every season! 5. Tie Front Button Up (now 40% off! ): On sale for $35 + the cutest little front tie option (or you can button fully and make it more of a tunic fit). 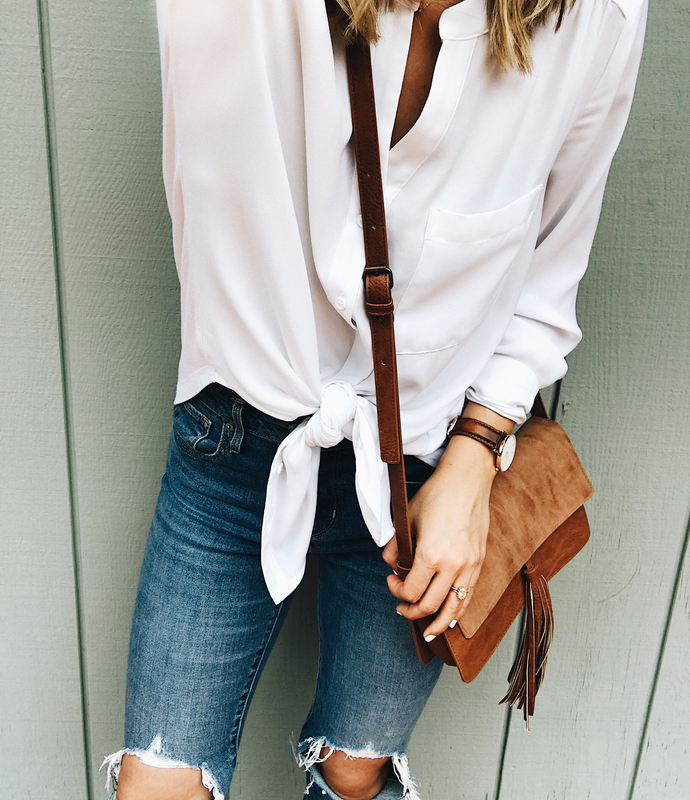 Perfection with go-to skinnies and a cute handbag for everyday!